Sid Richens was born on 25 October 1913. ‘B’ Flight included Flight Lieutenant Thomas 'Pat' Pattle, Flying Officer Greg Graham, Flying Officer John Lapsley, Pilot Officer Sidney Linnard, Pilot Officer Vincent 'Heimar' Stuckey, Flight Sergeant Richens, Flight Sergeant Trevor Martin Vaughan and Flight Sergeant Charles Casbolt. Sub-Flight two included Flight Lieutenant Ralph Evers-Swindell (leader) (L8010), Flying Officer Wanklyn Flower (K8011) and Flying Officer P. T. Dowding (K7912). Sub-Flight three included Pilot Officer Harold Sykes (leader) (K8003), Sergeant Donald Gregory (K8051) and Flying Officer Sidney Linnard (K8017). Sub-Flight four at 14,000 feet included Flight Lieutenant 'Pat' Pattle (leader) (K7971), Flying Officer Greg Graham (L8008) and Flight Sergeant Richens (K7892). The plan was for Sub-Flight one to engage (or being engaged) by the Italians, do what it could until Sub-Flights two, three and four would be ordered to enter the combat on seeing the trend, the overall control being given to Sub-Flight four. All formations flew in a broad vic and it was the first time that the 80 Squadron operated at full operational strength. Richens was promoted to Warrant Officer on 1 October and accompanied his unit to Greece. Richens was commissioned on 12 August 1941, being promoted to Flying Officer on 1 October and Flight Lieutenant a year later. 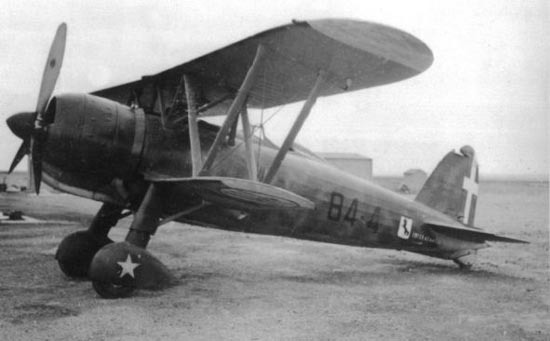 Richens ended the war with 2 biplane victories, these being claimed while flying Gloster Gladiators. He subsequently transferred to the engineering branch, receiving promotion to Squadron Leader on 1 July 1951. He retired on 25 October 1962. (b) The 80 Squadron claimed 8 and 3 probables while suffering 2 aircraft lost and 3 damaged. The Regia Aeronautica claimed 9 and 5 probables while suffering 2 aircraft lost and 1 one force-landed.